Thanksgiving is a time when we gather with loved ones to give thanks and celebrate with a holiday feast. Many pet parents include Fluffy & Fido in the gathering. These lucky cats and dogs will be extra thankful this year if their people follow some simple Thanksgiving pet safety guidelines! 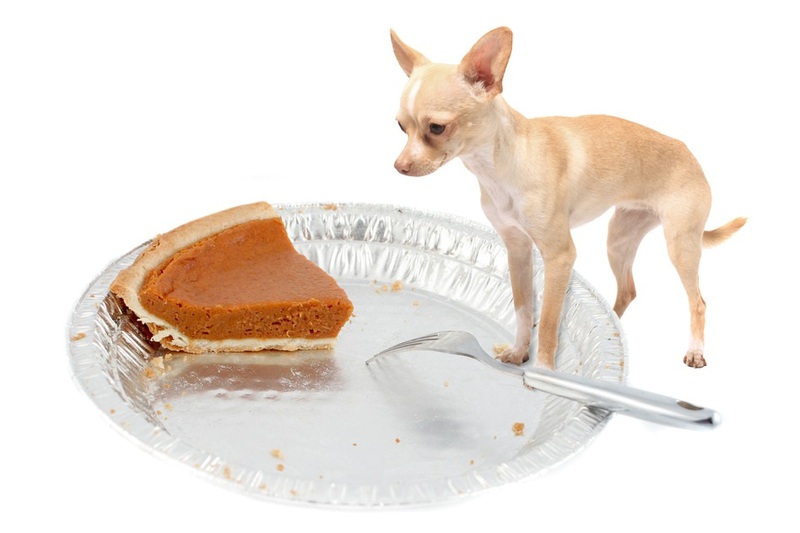 Can dogs eat turkey for Thanksgiving? Often times the food we eat is not safe for our four-legged friends. A bit of well cooked (never raw!) turkey may be ok, but forego the fatty skin and greasy drippings from the pan. These items are high in fat and can cause tummy upset in our pets. Common results would be vomiting and diarrhea. In severe cases they can cause Pancreatitis. NEVER give your pet poultry bones. Cooked bones splinter easily and can become lodged in the esophagus, stomach, or intestines. They’re also a choke hazard! Careful your pets don’t get any raw bread dough. The yeast in the dough will convert sugars to carbon dioxide gas and alcohol. This can quickly become a life threatening emergency! Consuming chocolate is not safe for your pets! Candy on the coffee table, in a handbag on the floor, or dropped by a child can put your pet at risk. 2oz of chocolate can be fatal to a 20-pound dog. Symptoms of chocolate poisoning may include vomiting, diarrhea, increased body temperature, muscle rigidity, rapid breathing, increased heart rate, and seizures. Advanced signs include cardiac failure, and coma. Seek Veterinary care for your pet immediately if you suspect they have eaten chocolate. Xylitol is harmful to pets. That purse on the floor may also be holding gum, mints, candies, or human dental hygiene products, which often contain Xylitol. This sugar substitute is becoming more common in our foods, and can be deadly for our pets. It is estimated to be 100 times more toxic than chocolate to dogs! With some brands of gum, as few as 9 pieces can result in liver failure to a 45 pound dog. Symptoms of Xylitol toxicity will begin within 15-30 minutes of consumption, and can include vomiting, weakness, in-coordination/walking like drunk, lethargy, tremors, seizures, and coma. Seek Veterinary care immediately! Keep your pets out of the trash. Wrappings that food comes in and the turkey carcass can be too tempting for even a well-trained dog, and both can pose a deadly hazard to cats and dogs! Remove the trash immediately after your meal to ensure the safety of your pets. Keep pets safe indoors during holiday gatherings. Guests may not be aware that pets will take any opportunity to sneak outside. Some pets are very shy or anxious around new people or crowds. For their own protection, it may be best for some dogs and cats to be contained to a safe place in the house while guests come and go. Make sure your pets are micro-chipped and wearing ID tags – just in case! Quick action can save lives! According to the American Veterinary Medical Association, if you believe your pet has eaten something dangerous, or if you can see your pet is in distress, call your Veterinarian immediately. ASPCA Poison Control Hotline may also be of help 888-426-4435. If your holiday includes travel, make plans for your pet well in advance. Hiring a professional pet sitter to visit your pets at home minimizes exposure to illness, and reduces stress (yours and theirs). Pets are much more comfortable in their own familiar surroundings, and you don’t have to worry about drop off and pick up times. A Professional Pet Sitter will care for your pets and your home, and send updates and photos on how your pets are enjoying their ‘stay-cation’. Professional Pet Sitters offer that piece of mind you need during hectic holiday travel.